Today’s defence-related news includes reporting on the Warrior armoured vehicle upgrade. The Times has highlighted issues with the upgrade programme, referencing a letter from the Ministry of Defence's Permanent Secretary to the Public Accounts Committee that specifies delays and budget issues. The upgrades will increase the vehicle's service life-span and improve its weapons system, making it fit for future combat with the infantry. 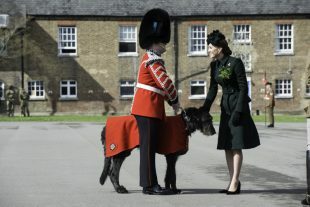 Domhnall, an Irish Wolfhound and the Regimental mascot of the Irish Guards, is presented with a sprig of shamrock by The Duchess of Cambridge.